Brilliantly captures the look and feel of classic Star Wars, but beneath its cinematic flair lies a pretty generic multiplayer shooter. What is it? Multiplayer-focused FPS set in the Star Wars universe. There are no Gungans here. No pouty teenagers talking about sand. No tedious conversations about the taxation of trade routes. This is proper Star Wars. Speeder bikes, Stormtroopers, and Imperial walkers. Han Solo, lightsabers, and sarlacc pits. Battlefront is the most successful attempt yet to recreate the look and feel of the original trilogy in a game, but as an FPS, it doesn’t quite live up to those stunning production values. In the thick of a 40-player battle, with X-wings screaming overhead, John Williams’ score blaring, and laser fire criss-crossing the battlefield, Star Wars Battlefront can feel like the most exciting game ever made. Its large-scale battles are chaotic, breathless explosions of iconic Star Wars imagery, and it’s hard not to get swept up in the spectacle. You really do feel like you’re in the films. In that respect, it’s a triumph. There are four planets to fight on, each of which contain several maps. There’s the desert world of Tatooine, the forest moon of Endor, the snowy plains of Hoth, and a volcanic planet called Sullust. Powered by DICE’s Frostbite engine, they all look fantastic—especially the dense foliage and towering trees of Endor. Maps include the crash site of a Rebel transport ship on Endor, Echo Base from the The Empire Strikes Back’s Battle of Hoth, and Tatooine’s Jundland Wastes. They’ve captured the lighting, atmosphere, colours, and general feel of the movie locations perfectly. And they’re full of neat little fan-pleasing details too, like the Ewoks on Endor who scurry into their treehouses when you approach, Tusken Raiders on Tatooine watching battles from afar, and mouse droids squeaking around Imperial bases. It’s clear the environment artists at DICE love Star Wars. They’re superficial details, of course, but add to the game’s impressive authenticity. Every prop, from vehicles to random crates, look like they’ve been plucked straight from the films. 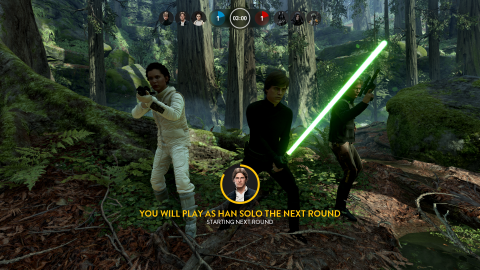 Multiplayer infantry combat is the main focus of Battlefront. There are nine modes, ranging from smaller 3-6 player matches, to all-out battles for up to 40 people. These include the brilliant, hectic Walker Assault, which sees the Imperials defending a pair of AT-ATs and the Rebels trying to destroy them. And Supremacy, in which two teams of 20 fight for control of five points on a large map. These are by far the best modes the game has to offer, mixing infantry and vehicle combat at a frantic pace. Unlike in previous Battlefront games, vehicles are accessed by picking up spinning power-ups. Grab an X-wing icon, hold down the activate button, and after a few seconds—providing you don’t get shot—you’ll magically appear in the air. Being able to see a vehicle on the battlefield, jump in, and take off seamlessly would have been much more immersive, but for whatever reason, you can’t. Vehicles you can control include AT-ATs, AT-STs, A-wings, X-wings, and TIE fighters. And if you’re lucky enough to grab a hero power-up, you can fly Slave I or the Millennium Falcon. On a GTX 970 with 16GB of RAM, Windows 10, and a relatively old i7, the game runs at a solid 60fps at 1080p with everything set to max. I was impressed that there was no shift in frame rate from the relatively empty Hoth to the busy, foliage-dense Endor. Check out MaximumPC's optimization guide to run the game smoothly on your PC. This would be more exciting if the ship combat wasn’t basic to the point of feeling like a mini-game. There’s no weight or nuance to the flight model whatsoever, the differences between the ships are negligible, and the lock-on is so generous that it feels like it’s doing most of the work for you. This, combined with the weightless, floaty controls, reduces Star Wars’ famous dogfights to a joyless chore, and I’ve now reached the point where I just ignore starship power-ups if I see them. There’s a mode dedicated to ship combat, Fighter Squadron, but it’s a glorified shooting gallery. It’s when you’re in the boots of a Stormtrooper or Rebel soldier that the game is at its best, but the infantry combat has a few problems of its own. The blasters look and sound amazing—exactly as they do in the films—but they feel lightweight and weedy. And with such memorable names as the RT-97C, A280C, CA-87, T-21, and SE-14C, it’s difficult to tell them apart. Some have a faster rate of fire, some are more powerful, some take longer to overheat, but they all feel vaguely the same. The moment-to-moment FPS combat lacks punch, which is a problem in a game that’s largely about shooting people. It’s in the smaller modes like Blast (team deathmatch, basically) and Cargo (capture the flag) that the cracks begin to show. The Star Wars buzz wears off and you realise that you’re playing a completely rote, by-the-numbers multiplayer FPS. You’re on Tatooine, and there’s a sandcrawler over there, but you’re still just sprinting in circles, killing, dying, killing, dying. Earn XP, unlock a better gun, kill, die, kill, die. Outside of the big 40-player modes, Battlefront is disappointingly generic, and no amount of beautifully crafted, authentically recreated nostalgia can mask that. But it does have some ideas of its own, including the ability to play as a selection of famous Star Wars characters. The Empire gets Darth Vader, the Emperor, and Boba Fett, while Leia, Luke, and Han represent the Rebels. They have increased health, more powerful attacks, and unique powers including flying (Fett), force-choking (Vader), and dropping power-ups (Leia). I love watching players flee in terror as I approach them as Vader, but the heroes are far from invincible: it only takes the simplest of coordinated attacks by the opposing team to reduce their health to zero. In Supremacy and Walker Assault, seeing Vader or Luke charging across the battlefield with their lightsabers glowing, or Boba Fett floating overhead launching rockets, is genuinely exciting, because it happens relatively rarely. But in Heroes vs Villains mode, where all six characters engage in battle at once, it just looks daft. I laugh every time the Emperor spins through the air like M. Bison doing a Psycho Crusher in Street Fighter—not helped by the fact that he sounds like Mr. Bean. With a few exceptions, the voice acting is terrible. Vader sounds like a man speaking into a pint glass, and Luke’s actor couldn’t sound less like Mark Hamill if he tried. For £50, you don’t get much—and that price isn’t likely to fall any time soon. After 20 hours with the game, I feel like I’ve seen everything several times over. I’m bored of most of the maps, and only feel compelled to return to a handful of its nine modes. It feels like they’ve sliced the game in half to sell the rest as DLC, and the £50 they’re charging for the season pass is ridiculous. There’s little depth to uncover, which has really harmed its longevity for me. I don’t feel like my skills have developed in any meaningful way—as they would after 20 hours of something like Counter-Strike—because it’s so basic. But games are for everyone, and not every player wants a super deep FPS to master. Battlefront is, for all its flaws, wonderfully accessible. It’s polished, easy to play, and the interface is simple and intuitive. They’ve created a game that anyone can play—from kids to adults—and that’s admirable. Everyone loves Star Wars, and Battlefront reflects that mainstream, cross-generational appeal. But the downside of chasing such a broad audience is that, as a competitive shooter, it’s fairly shallow. It's a shame there's no single-player campaign either. A selection of fun missions that can be played in co-op or solo—a speeder bike chase through Endor, toppling AT-ATs on Hoth, invading Echo base as Vader—are proof that, if they were strung together with even a loose story, it could have worked. These missions, which replicate key scenes from the films with some artistic license, are among the most fun I had with the game—but there aren't enough of them. Ultimately, the best rewards in Battlefront are the emotional ones: the thrill of weaving a speeder bike through the trees on Endor, seeing the twin suns of Tatooine, or watching Imperial walkers stomp across the Hoth snowfield. The addition of extra modes, weapons, heroes, and maps might improve the core shooter experience and give it some much-needed depth, but when it costs as much as the base game to get them, you have to question whether you’re willing to spend £100 to find out.